An economical and accurate thermistor (2252 ohm @ 25°C) probe with an easy-grip molded handle, 3/16" dia. and 1' retractable cable. 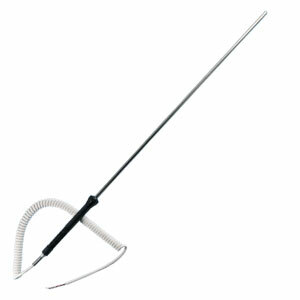 The 12" length probe can be stored in toolboxes or other locations for easy access. The retractable cable expands to 5'; standard termination is stripped lead wires. Note: For phone plugs, add “-PP” to part number with with additional cost. Accuracy is: ±.2°C from 0 to 75°C ±1.0°C from -80 to 150°C.